After so many leaks and rumors, Nokia has finally launched their new flagship Nokia 8 smartphone in an official event today in London, however the company haven't released the entry-level Android smartphone Nokia 2 in the official event. The Nokia 8 comes with Polished Blue, Tempered Blue, Steel and Polished Copper color options and is priced at 599 Euros (around $700) which is a good price for a Snapdragon 835 phone. The Nokia 8 will be available for shipping starting in early September globally, so it will be available for sale in most of the regions including UK in the next couple of weeks. The official Nokia 8 page mentions that the device runs on the Android 7.1.1 Nougat OS and will get all the upcoming Google Android updates before others, so that means it will get the Android O most probably, pretty soon after its official launch on August 21st. The new Nokia 8 features an organic full aluminium unibody design that is machined from a single block of 6000 series aluminum with polished mirror finish. The device comes with the Nokia OZO spatial 360 degree audio that uses the 3 microphones of the phone and the Nokia acoustic technology algorithms to capture the HQ sound for playback. Broadcast feature is also integrated into the device camera app to broadcast live to Facebook or YouTube. The device features a dual rear camera with ZEISS optics and OIS and its the company's first Android phone with a dual rear camera. The Nokia 8 comes with a 5.3-inch Quad HD LCD display at 554ppi pixel density with 2560×1440 pixels resolution, sculpted Corning Gorilla Glass 5 protection and 700 nits brightness. It is powered by the octa-core Snapdragon 835 Mobile Platform with Adreno 540 GPU. It comes with 6GB of DDR4X RAM with 128GB (UFS 2.1) internal storage option and 4GB of DDR4X RAM with 64GB (UFS 2.1) internal storage option with both supporting MicroSD card expandable storage up to 256GB. The Nokia 8 runs on the Android 7.1.1 (Nougat) OS out of the box and is upgradable to Android O whenever available. It also supports single and Hybrid Dual SIM options. It features a dual rear camera with a 13-megapixel colour sensor that comes with OIS and a secondary 13-megapixel Mono sensor with ZEISS optics, 1.12um pixel size, f/2.0 aperture, 76.9-degree wide-angle lens, PDAF, IR range finder and dual tone flash. It also comes with a 13-megapixel auto focus front-facing camera with display flash, ZEISS optics, PDAF, 1.12um pixel size, f/2.0 aperture and a 78.4˚ lens. 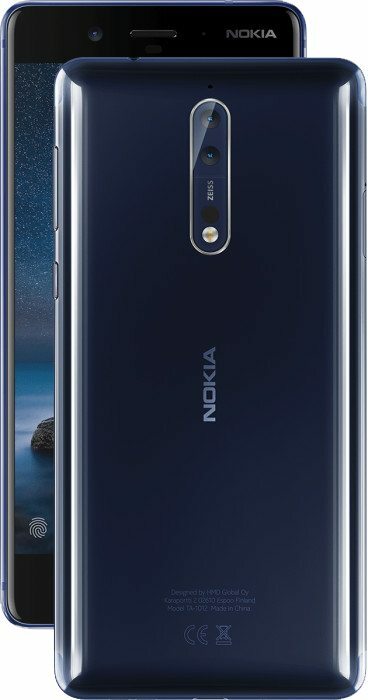 The Nokia 8 is backed up by a 3090mAh non-removable battery with Qualcomm Quick Charge 3.0 feature and connectivity options includes 4G VoLTE, Wi-Fi 802.11ac (MIMO), Bluetooth 5.0, GPS/ GLONASS, USB Type-C 3.1 Gen 1 and NFC. It has a fingerprint sensor available on the physical home button on front and also comes with a barometer. 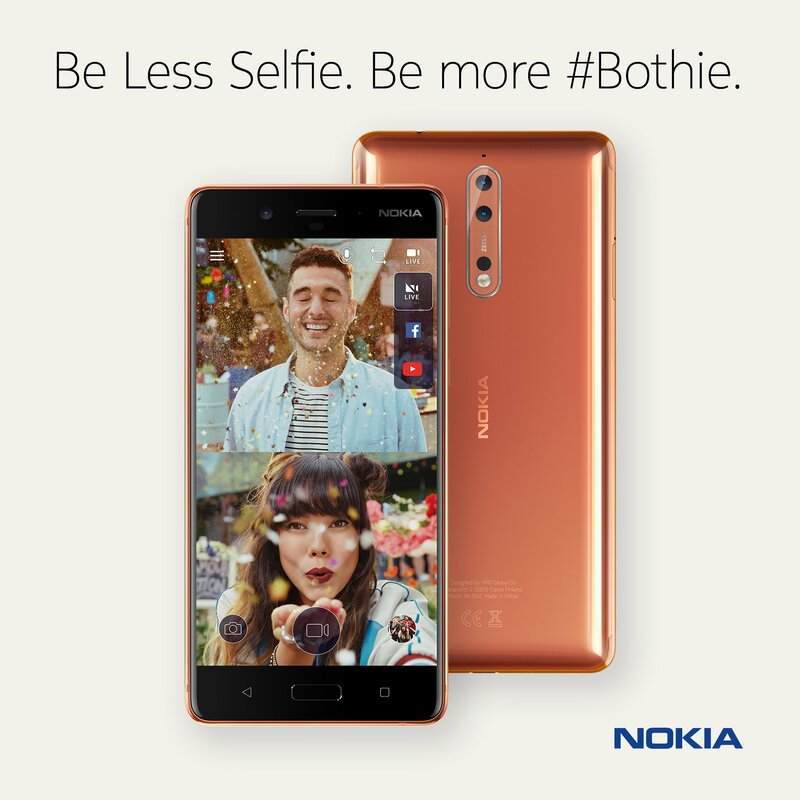 The device has a 3.5mm headphone jack, 3 microphones and the Nokia OZO 360° spatial surround sound features available to enthralled your Nokia 8 experience. It measures 151.5 x 73.7 x 7.9 mm and is Splashproof with IP54 ratings.